Wouldn't it be much nicer to spread the love and the cheer of gift giving rather than grumble and complain about the way our government is being run or gossip over the life of another human being? I am tired of hearing about war and violence. I guess, it is about time that we start doing small acts of kindness and goodness so that others too, may find that there are still lots of kindred souls scattered about the planet. I found this really great scheme at my friend Ria's place. 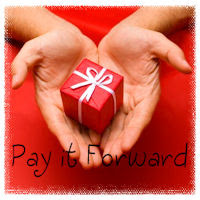 It is called Pay It Forward. 1. The gift will be a mystery of my choice, created especially for the recipient (in my case, I am not very crafty so I will try my best to make something special for you). 3. If you're one of the five, you must make a post in your blog offering to make a gift for five people, spreading the joy of creation. 4. When you receive your gift, you should make a post on your blog and show everyone inspiring others to follow the chain and participate. How easy is that - to make someone else happy - everyone should be doing it. Oh and if you don’t have a blog that’s okay too - you can post on your facebook/myspace page. So to these lucky ladies, kindly send me an email at anak0430(@)gmail(. )com for your home adresses. That sounds like a really nice idea! oi this is nice! now am complaining i have little time to do lots of things hmmmmmm.